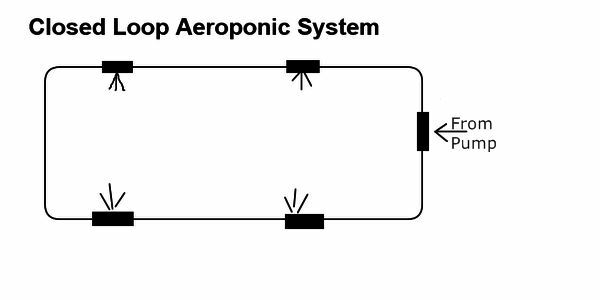 This DIY Aeroponics tutorial will show you how to build a high pressure aeroponic system. If you want to grow an aeroponic garden this is the best way to go. My low pressure aeroponics system works well but you will get better results with a high pressure system. Unless you have thousands to spend a homemade aeroponic system is your only choice. Even if you had the money to blow most systems weren’t designed to grow aeroponic weed. This is a very easy build so even if you are not the do it yourself type you will be able to pull this off. 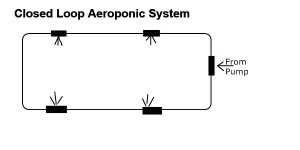 My aeroponic system is very simple and works very well. It is simple on purpose because most systems you see online are smarter than their owners. Eventually something goes wrong and you lose your crop. This system has been up and running for over a year, grow after grow. In all that time I have never lost a crop or had a clogged mister head and I don’t even bother to clean them. All you need to do to grow successfully with this system is keep it running, monitor your nutrient level and check your pH and ppm daily. 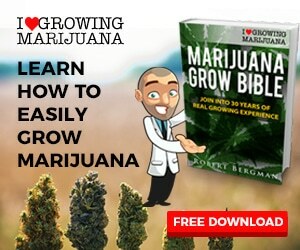 If you can do that you can grow aeroponic weed successfully and without doubt it will be the best weed you ever grew. There are a two changes I would make to this system one year later but they are minor. 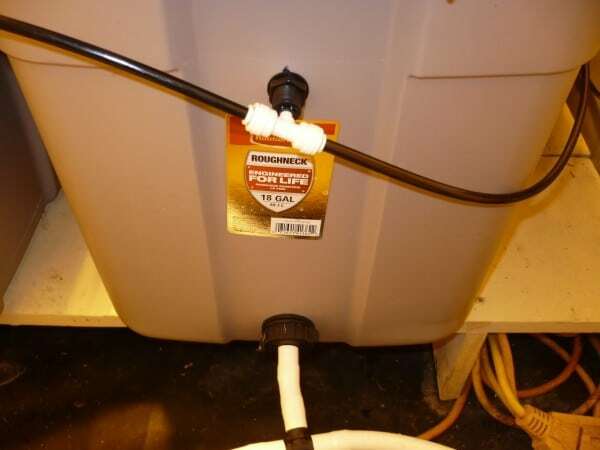 The original system is built with 1/2″ drain line and fittings. I have had a few clogs at the tees so would advise using 3/4″ line instead. The other change would be the misting assembly. I used reptile misters but they were expensive, had too much movement and were definitely overkill. They used Tefen misters and I still use these and recommend them but I have found a more cost effective and efficient way to use them. The housing for this system is 18 gallon Roughneck Rubbermaid totes. They are about $10 at any Home Depot. I have tried others and either they leak or they are not as tall so I really recommend you go with these. The totes can be connected together to drain into a common reservoir. You will need to figure out how many plants you want in each tote. I have 12 holes but seldom use them all. You can always plug the extras with a party cup or net pot and insert. I use three rows of net pots with misters placed on either side of the middle row. This helps give a clear trajectory for the mist to spread inside the tote. You can use 2 or 3″ pots. I prefer 3″ pots because they are more stable and plants don’t tip them easily. Please be aware you will need to cut a smaller hole than this. Either 1 7/8 or 2 7/8. If you use a 2 or 3 inch hole saw your net pots will fall through! This 2 7/8″ hole saw comes with a built in arbor so you can put it straight into your drill chuck. In this picture you can see the reptile misters I used. They are actually on but the mist is so fine most of it doesn’t show up on camera. I think Tefen misting heads are the best choice for aeroponics systems. The whole tote will fill up with mist so I think 4 heads per tote – 2 on on either end is plenty. Below are the misting heads I used for this aeroponic build. These run 1/4″ mainline. They are not cheap but the quality is excellent. Here is a detail of the drain lines. The totes are elevated about 8″ above the reservoirs bottom. This helps drainage and also allows you to add water to the reservoir without having standing water inside the totes themselves. This is 1/2″ tubing but I would suggest using 3/4″ instead. There is a curve in the bottom of these totes. Before you drill your drain holes you will want to make sure the gaskets on the fitting are sitting on the flat part of the tote otherwise they may not seal completely. 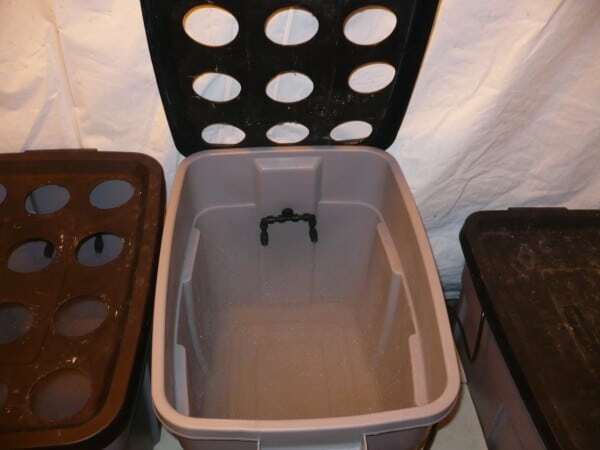 This also means that there will be a small amount of water left in the totes because the fitting wont be entirely flush with the bottom of the tote. I lay a piece of 2×4 flat under the back of the tote to give it a slight downward angle towards the fitting and help it drain. It’s not necessary to do this. The small amount of water in the bottom is actually a good thing. No matter how tall you make a tote eventually the roots will hit bottom. Different strains also have different sized root systems. 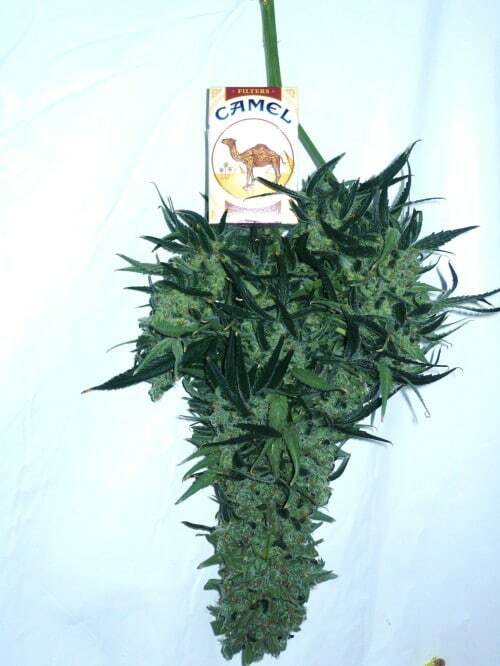 Sativas seem to have the longest roots. The water that remains is constantly refreshed and aerated and once your plants roots hit bottom it provides some insurance in case of a power outage. If you don’t want water to remain in your tote you could put your fitting right on the bottom of the tote and allow the tote end to hang over the side of its platform. The floor of my grow room is lined with epdm pond liner. Just in case there is a spill it wont leak out. You will want to use an ebb and flow fitting for each tote. Alternatively you could probably use rubber grommets instead but the plastic on these totes is not that thick and they may not seat well. You will need to get a spade or forstner bit to drill these holes. Mine were 1 1/8″ but yours could be larger or smaller because fittings are often made by different manufacturers. 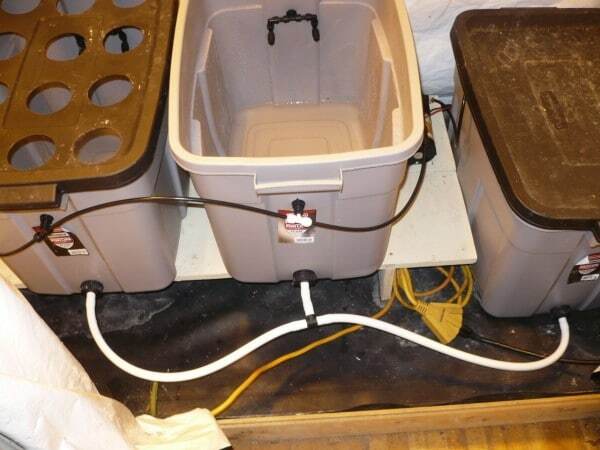 My original aeroponics diy system cost me about 300 dollars to build. I have found new sources for the pump and fittings and you should be able to build it for a lot less. It had only 2 totes in these pics but I later added a third. Your main expense is the Aquatec 8800 booster pump which is around $100 followed by the John Guest fittings and misting heads. Make sure you get the right pump. The Aquatec 6800 is not suitable for this build. It won’t provide enough pressure! 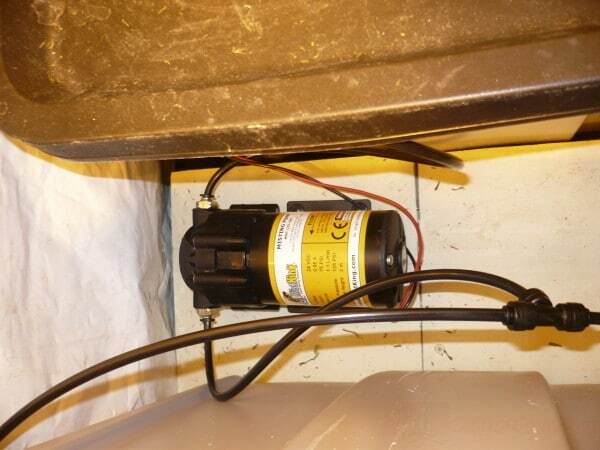 This pump can go up to 125 psi and comes with 1/4 and 3/8 push to connect fittings. I used 1/4 for my aeroponic system and it works great. But if you are going to run more than 3 or 4 totes you may be better off with a 3/8 mainline. Just a heads up here, if you do choose to run 3/8 you will have to reduce it to 1/4 at each misting head. In the original version my aeroponic system used reptile misters. They were not only expensive to buy but the cost of shipping out of Canada was ridiculous. So I went to work finding a cheaper solution. First you need to understand your misters will be in a closed loop. You will use a tee at each misting head and connect them all in a loop with one tee at the end that goes to the pumps output. This is a detail of my original build. You will want 2 separate misting heads. You can see there is a mold line a few inches down from the top of the tote. This is the perfect height for your misting nozzles. You can also clearly see the curvature on the bottom of the tote and how to place the drains. I recommend using 1/4 inch fittings because it is easier than reducing things at the misting heads but for more than 4 totes you may be better off with 3/8 tubing. When you insert tubing into your fittings make sure the ends are cut even and square and push it all the way into your fittings. It will grab before it is fully seated so make sure to keep pushing until you feel it bottom out against the fitting. If you don’t you may have a leak. Here is a close up of the pump. You can see the tee coming off the loop and connecting to the pumps output port. The other side of the pump has a line into the reservoir. Here is another view showing the Aquatec 800 hooked to the system. Please note that this is not a submersible pump! You are going to need a filtration system. Your misting heads have small orifices and you cant count on their screen to do the job. That screen is an emergency stop gap measure just in case something gets past your main filter. 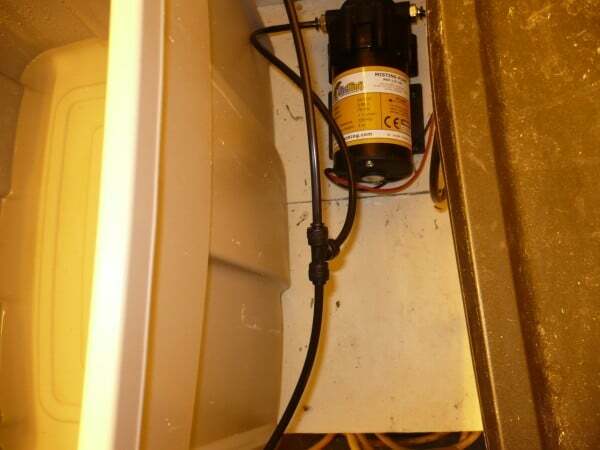 No matter how careful you are stuff will get in your reservoir. 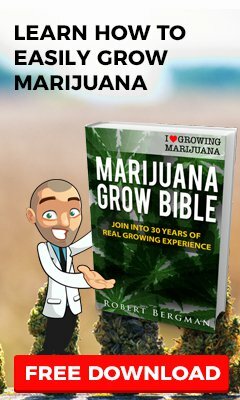 It could be bits of root that sloughed off your plants, could be impurities in your nutes, rock wool, cat hairs, human hairs or plant debris. The point is dirt is everywhere and no matter how clean you think you are or how careful you are it will find a way in. So we need a really efficient filtration system. Clogged misters can result in plants dying so we want to prevent that. Fortunately I found a simple and inexpensive way to do this. 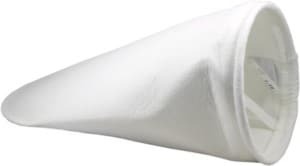 I use a filter bag designed to filter fuel. It has pores that are 10 microns. A human hair is about 40 microns thick. It is polyester felt and can be washed and run through the dryer to clean it. As long as no dirt gets in the bag itself it will keep your system running clean. Yes I know this may look a bit hokey but it works. I have never had a clogged nozzle and I don’t clean them either although I probably should have a look at them. These filters work great for lots of things and actually I discover them while looking for an overflow filter for my reef tank. I would recommend using a covering on the top of the filter bag for added safety. I don’t run a lot of water in my system. 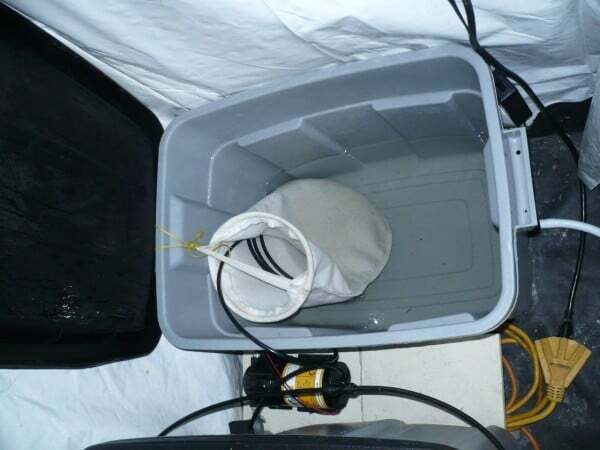 There is a gallon or two in the tote bottoms and about 5 gallons in the reservoir itself. That means you mix and use a lot less nutes but it also means you will be topping up fairly often. When my plants are flowering heavily I find they can drink 3 or 4 gallons a day. Your system needs one more thing and that’s an aeroponic timer. Regular timers wont work because the cycles are too long. You need an interval or seconds timer. I run 1 minute on and 5 off but some growers use shorter cycles. You will need to experiment to find the best settings for your plants but 1 on and 5 off is a good starting point. I use the CT-1 Short Cycle Timer and have had great luck with it. The only caveat is that it has day, night or both cycles. You need to make sure both the sun and moon icons are showing on the screen otherwise it will not run a 24 hour cycle. It is very adjustable. You could run 1 second on every 24 hours if you wanted. 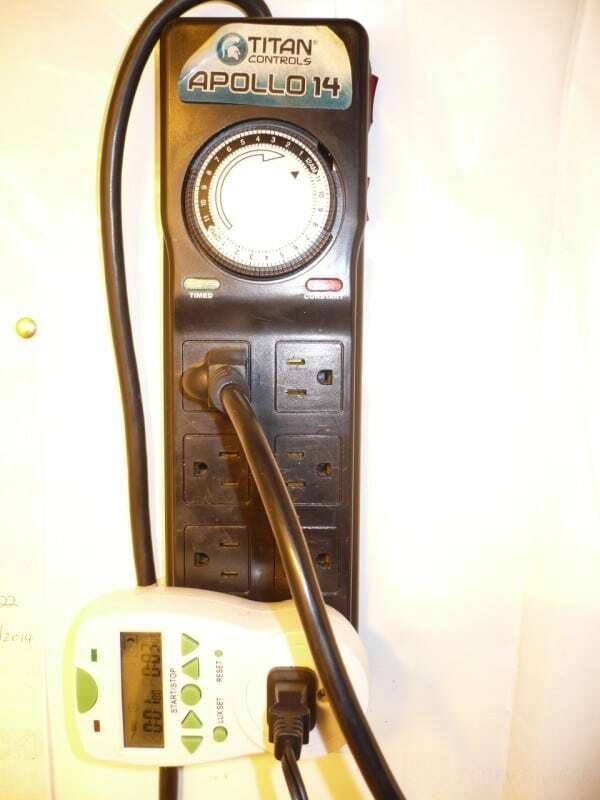 You can have it on or off for seconds, minutes or combinations of the 2. I hope you enjoy building your high pressure diy aeroponics system and get some good grows out of it. Well that’s pretty much it. I tried to be clear and detailed but if you still have questions leave a comment.